It's been years since the release of Drumagog 4, can version 5 keep up with the new kids? An impressive update to a modern-day classic, Drumagog 5 is able to hold its own in the face of stiff competition. Auto Hi-Hat Tracking works great. Great dynamics tracking and controls. Plug-in hosting is handy. Solid phase alignment. No leakage suppression. Would benefit from some tweaks. Some features are a little esoteric. Fiddly to set up with complex material. For years, Drumagog was the only drum replacement plug-in worth its salt. It's a versatile and well-respected tool, so to say that we've been agog waiting to see what WaveMachine Labs would come up with for v5 would be an understatement. Drumagog 5 comes in three versions, Basic, Pro and the full-featured Platinum, which we're reviewing. Many of the functions from version 4 are still to be found but it's a huge relief to see a fresh, less-cramped GUI, which is easier on the eye and far less hassle to navigate. "It's a huge relief to see a fresh, less cramped GUI." The way you set up Drumagog to trigger from audio source material is still the same: you set the input level so that the incoming signal fills most of the rolling display in the lower left, then set the Sensitivity slider and adjust the Resolution control, which you'll set to a finer value for material where hits are closer together (eg, fast rolls, drags, etc). Alternatively, you can leave the latter set to Auto, as we did for most of our tests. Detected hits show up as white dots on the display. There's a Transient Detail slider that you can decrease if extraneous hits are generated, though we'd recommend keeping this as high as possible if the drum parts have much in the way of quick flourishes. By following the above method and using the default Advanced triggering mode, we had no issues getting a kick drum to trigger nicely right off the bat, and it was easy to trigger basic snare work via the (slightly fiddly) Trigger Filter section. We were really impressed with how well dynamics were represented for moderately paced material, which is a real improvement over v4. However, faster and more complex material left us scratching our heads at first, especially if there was bleed in the audio - it turned out to be crucial to apply just the right filter settings. Advanced mode can optionally be used with Auto Align 2.0. There's a Live mode, too, which has a fixed 2ms latency and isn't phase accurate. While it didn't interpret dynamics quite so well, and is more prone to mistriggering if you set the sensitivity too high, we were surprised to find that it was often easier to dial in accurate triggering here than with Advanced mode. The Stealth mode from v4 is still present, which we're happy about. Here, when a hit is detected, the audio fades out briefly while the sample plays. This means you can replace the attack of drums wholesale while keeping all of the interesting stuff that's bleeding through between hits - now that really is useful. One intriguing addition is Auto Hi-Hat Tracking: this triggers from a hi-hat mic, detecting when it's closed, half-open or fully open, and enabling accurate replacement of all three articulations. It worked like a dream in our tests and we're sure it'll find many fans. Two areas in which Drumagog excels are dynamics and realism; in v5, the Random Multisamples function randomises sample playback, for more natural results. You can also adjust dynamic levels with the Groups button. Further to this, the Dynamic Tracking function acts similarly to an audio compressor, adjusting the level of each sample played to even out the performance. We found one glitch. Let's say you want a fixed-velocity sound and so disable Dynamic Multisamples - Drumagog now plays the quietest samples of the set, which isn't ideal, as even if you boost their level, they're soft hits with a low signal-to-noise ratio, thus they sound too gentle and will introduce loads of noise. Presumably this will be fixed in an update. Drumagog 5 ships with 4GB of instrument samples, covering a good number of drums and cymbals. Many instruments are velocity layered. Some include rimshot and sidestick material, and a few have overhead and room samples for layering. When available (or imported into a custom instrument), these extra samples can be controlled by the mixer at the bottom. You can also import samples to create layered patches. Still present is the built-in synth; this has been updated and, while it could be a lot better, is still good for beefing up drum sounds, or, if you want, creating odd effects. Speaking of which, the new Morph|Engine introduces wild effects that would be more at home in electronic tracks. It seems a tad gimmicky and out of place to us. Of course, many of us turn to virtual instruments such as Superior Drummer 2.0 and BFD2 for drum sounds. To this end, Drumagog now features plug-in hosting, enabling you to load your favourite drum instrument directly into Drumagog. We tried this with SD2.0 and it worked nicely. You simply select a MIDI note to transmit to the plug-in and use a slider to set the balance between Drumagog's output and the hosted instrument's. 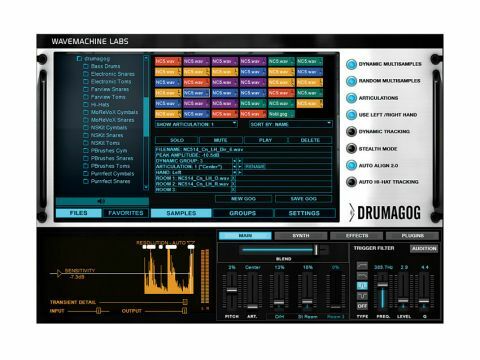 Not everyone will need plug-in hosting, but for those that do, it could be a prime reason to pick Drumagog over Trigger. Finally, Drumagog 5 features a convolution reverb, which, while 'no frills', is pretty good, although it only applies to the triggered samples, not the audio, which is a bit daft. Grumbles aside, Drumagog 5 is a worthy successor to v4. The massively improved triggering is by far the biggest attraction. We do feel that Drumagog would benefit from further refinement, and that certain features are superfluous, but current users certainly won't be disappointed should they upgrade.